If you’re in an executive or management position, then you’ll know just how much time and effort it can take to handle the many reports that cross your desk each month. Whether you’re answering queries, canvassing for comment or keeping track of various document versions - managing reports can end up being a job in itself. Fortunately, MYOB Greentree has introduced a new functionality designed to take the stress out of report and document management. Greentree’s new Reports and Documents functionality makes the whole process easier than it has ever been before. In a single window, you can view all the reports created by, or assigned to, you and quickly spot any ‘new’ reports that you haven’t yet opened (thanks to the automatic highlight and notification system). With this new functionality, you’ll never miss report updates or changes and can be sure that you’re dealing with the latest version because there will only ever be a single version – the most up-to-date one. Reports and Documents can also record discussions and shared comments between those people that have access rights to a document. Every question and the response is clearly itemised so you can quickly and logically follow who said what – and when. Additionally, the functionality can also provide you with a complete history of everyone that’s opened the document, commented on it and had access to it. And if you need to set a limit on how long people have to submit their feedback, you can easily set an expiry deadline that will render the report un-viewable from the date you set (particularly useful for budget reviews). Eminently flexible, you can organise this library to suit your company’s style of working, allowing you to drill down into as many different layers of information as you want. And just as with reports, the library gives you the same ability to add comments, create discussions and track engagement in your documents. You can also access a single document from as many different reference points within Greentree as you like. So, for example, a product manual held in the document library can be linked to a stock item in Greentree. Then, if the manual is updated the latest version is automatically linked to that stock item – this means that even if there are hundreds of stock items involved, all you need to do is to update a single source document. 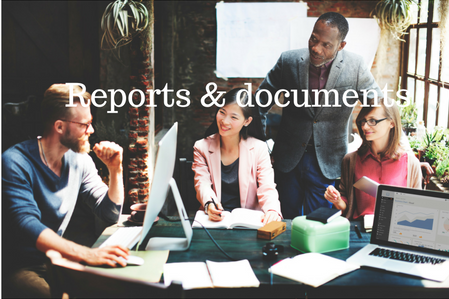 With Reports and Documents, you’ll have a fully visible trail across the history of any report or document. User-friendly, flexible and logical – this new functionality will save you significant time and effort, dramatically reduce reporting and information handling issues – and ultimately enable you to enjoy much more control over the data you’re creating and managing. If you’d like to learn more about how Greentree’s Reports and Documents functionality could help you and your team, get in touch with the team at Endeavour. As long-time Greentree partners, we've got all the support and information you need.